We have wooden flooring in the hallway and kitchen which is fantastic in the summer. In the winter, it can be a bit drafty and so the rugs come out. Unfortunately, we don't have one in the kitchen, though it is on the to do/get list. 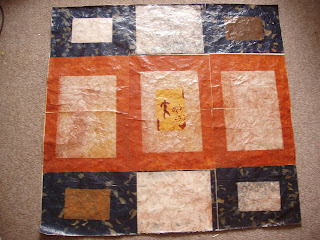 Inspired by the project here, I used the handmade paper I had here to make a paper rug. If I find a supply of handmade paper, that's not too expensive, I wouldn't mind making a larger one. This one will go in front of the worktop, so we can keep our feet warmer as we do our baking. Very cool. It will be interesting to see how well it wears. Wow! What a neat idea! And looks so cool! Nice! Have you thought of making your own paper? The basics are actually pretty darn easy. I am sure you could find something on YouTube. I helped a friend make some once for a journal, it had leaves and bits of mica and was just so pretty!